Kazuyoshi Miura—nicknamed “King Kazu” and one of Japan’s greatest and most adored footballers—has added another bullet point to his extraordinary resume by becoming the oldest player to score in a professional football match. The feat happened last Sunday, when the tenacious Yokohama FC striker netted the lone goal against Thespakusatsu Gunma in Japan’s J2 League. At 50 years and 14 days old on the day of the match, Miura broke a more than five-decade long record previously held by England’s legendary Stanley Matthews. 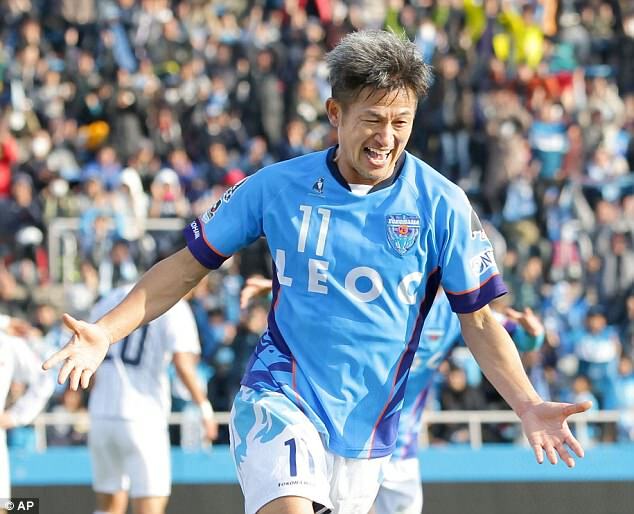 Fifty-year-old Kazuyoshi Miura is the world’s oldest goal scorer in a professional football game. This is not Miura’s first record-breaking encounter. Earlier this month, he became the oldest person to play in a professional football game (beating the prior record, also set by Matthews, by two days). In 2012, Miura also made history on the futsal side as the oldest player to feature in the Japanese Futsal League. Though his stint with professional futsal was relatively short, Miura’s participation in the 2012 FIFA Futsal World Cup—at the time he was a mere 45 years old—proved a highlight of the tournament and a testament to Miura’s technical skill and adaptability. Now in his 32nd professional season, King Kazu has amassed numerous other achievements and accolades over the course of his career. Fortunately for fans and for the wider world of football, Miura has no plans, it seems, of hanging up his boots anytime soon. To learn more about Kazuyoshi Miura, visit his web site at http://www.kazu-miura.com/en/profile/.